While working on my family's history, I have been noticing that the cars in the pictures can add a lot of colour to even the most black-and-white. I have spent the last month or so working to identify a number of these cars and I have been successful to some degree. But I have two pictures that I can't seem to get anywhere with. I attached a photo of a car that I would like to identify, but I am not sure where in this post it will appear. 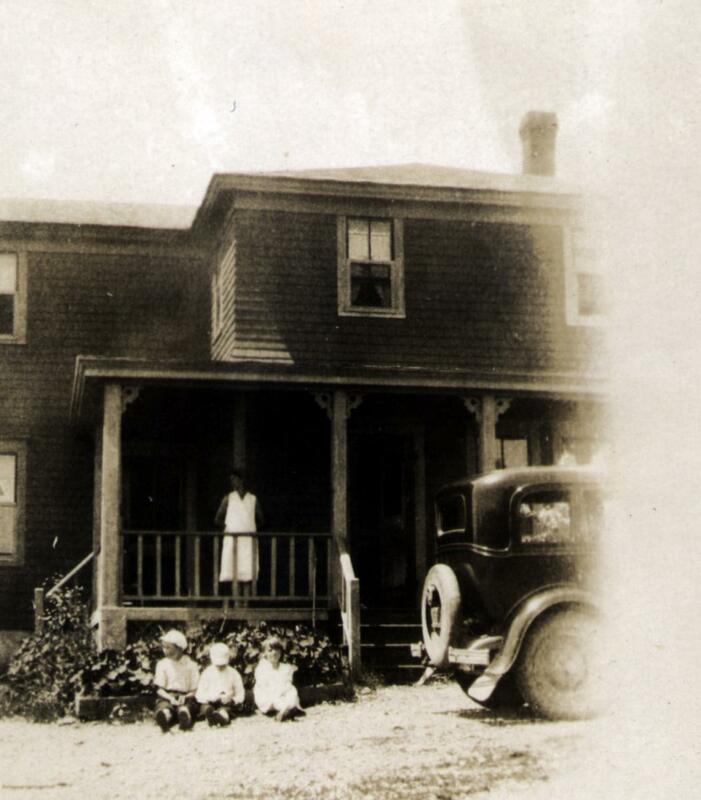 My maternal grandfather is at the wheel, a neighbour is on the porch of the family home behind, and a cousin is seen peering out of a curtained window just behind my grandfather's head. 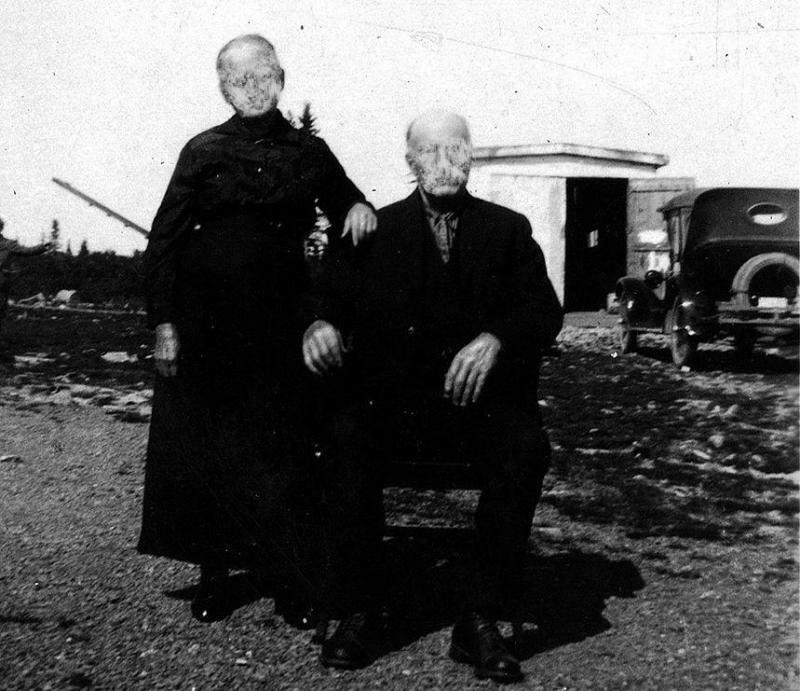 The picture was taken in Cape Breton somewhere between 1925 and 1942. When my mother was 14, she said that she went for a few-mile drive with her father, to a high point where they could look out over the Atlantic. The car radio was on and people were talking about Canada having just entered the war. They sat for a while, with my Mom and her young imagination watching a few ships passing far out to sea, wondering what this would mean. Perhaps this was the car. I am not that familiar with antique vehicles up close, so I don't have ready knowledge of how things work, and turn, and move with them, so sometimes I just can't tell what I am looking at. 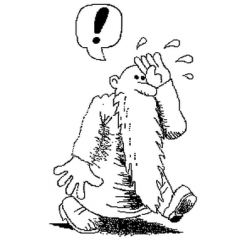 I have been learning some of the jargon, words like phaeton, motometer, etc., but I can have a good deal of difficulty posing a question or creating a query when given the opportunity. In this photo I was looking at features like the solid wheels, the twelve hub lugs, the non-acorn shape of the headlights, the door handles, where the latch is for the cowl, the mud scrapes (?) on the running board, where the doors hinge and latch, the objects beneath the soft top, what may be that extra contour that some engine covers have on both sides along its length. Is that some kind of chrome visor coming out above the windshield? The car makes that match the best to my uneducated eye are Packard, perhaps Buick. When looking for matching pictures online, I have not been able to find a database-like source into which I could submit a query. For example, if there was such a database of vehicles with fields for all of the major differentiating characteristics, one could go down a checklist and enter or tick off all things known or believed about a vehicle then "submit" the query and get a list of vehicles that might match, with photos if available. Of course, this would involve establishing the search criteria, making as complete a list as possible of vehicles to search through, then filling in the data fields to make it possible to generate a search result. The Google search engine has worldwide access and can pull up pictures that it thinks matches a given search, but the searches are unreliable, inaccurate and incomplete. A simple example of this would be a Google image search such as "1920's car -spoke -spokes". To a human, this would mean finding all pictures of cars on the Internet from the 1920's and eliminating the ones with spoked wheels. That's not what you'll get, though. Because the photos have not ever been tagged with useful search criteria, the search engine has no way of knowing what is actually in the pictures it retrieves. Does such a searchable database exist, even if it is just for only one make or model? Those 12 hub bolts are the key to the car's identification. 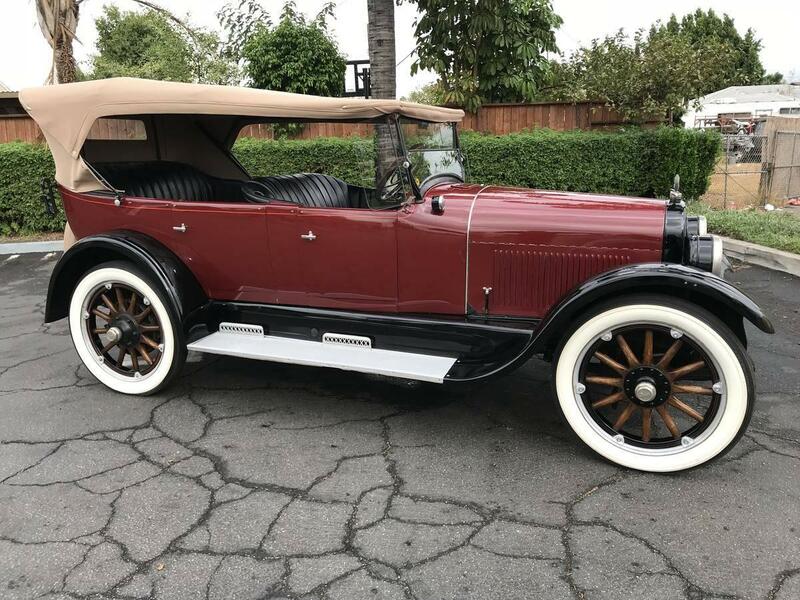 Looks a lot like this 1923 Buick....the car in question seems to have some added aftermarket items like a spotlight and what looks to be an exterior sun visor. It is called a "phaeton" or "touring" car, depending on the maker's name for the model. Does such a searchable database exist, even if it ﻿is just for only one make or model? Listening to a radio is unlikely to have been in this car! 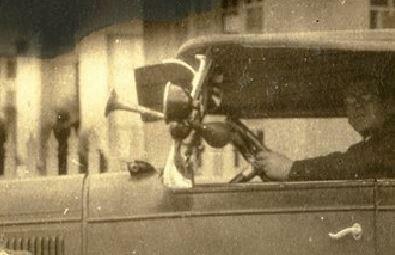 Car radios didn't really come into vogue until the mid to late '30s, although high end cars would have had them earlier. 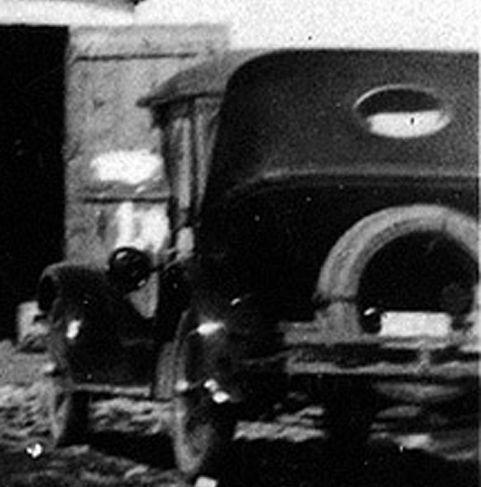 I have a copy of a factory photo of a 1930 Dodge Brothers 8 sedan with radio wiring going through the fire wall. If it was in this car, it would have been a portable radio! 1923 Buick as K31 indicates, but likely the 4cyl Country Gentleman model versus the larger 6 cyl which had the longer hood as per K31's photo. Thanks, keiser31, I think you may have identified the car. Is the protrusion from the windshield something you have seen before? Sometimes I look at it and see a swing on the porch instead of a part of the car. You may be correct. It does look like a porch swing. I guess the wheels are accessories, too. I rarely see them on a Buick. Thanks, Spinneyhill. My grandfather may not have a radio in this car. I have a few other photos of cars he owned later that may have. This car, though, could make another bit of family lore true. My Mom had also said that their family had the first car in their small village, and the first telephone, too. Her father owned a small general store and was doing okay. This is a picture of the rear end of another car in close to the same spot as the first. 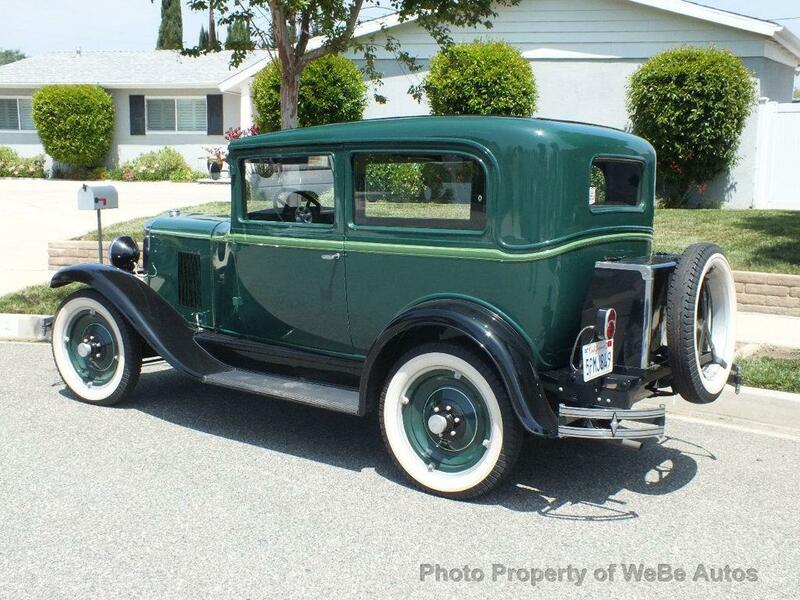 Maybe a 1929 Chevrolet. The taillight is mounted in a different place on this one, but I think it is usually mounted on the spare tire rack. Maybe with the accessory trunk, they decided to move the mounting. The car in your photo looks like a four door sedan. Thanks, Gunsmoke. I count 18 vents in the cowl in the picture I have, and 24 vents in the picture keiser31 provided. The smaller engine, then. Thanks, keiser31, for the tip re separating out the search for the second car. I will do that (and your thoughts on it noted). Thanks, keiser31, for the match on the solid wheels. What was the thinking with those - were they considered to be cheaper or premium, less maintenance, better for snowy weather? Thanks for finding a brightly-coloured match, in an era that I thought was "any colour you want as long as it's black". I kind of think that my grandfather's may have been black anyway - difficult to say with b&w photos. Hard to tell the mindset about disc versus wire spokes versus wood spokes. I imagine the discs rode rough whereas the wood or wire spokes may give a slightly softer ride. Maybe folks thought discs were more solid of a wheel than the other styles. Pure speculation on my part. I would agree, Zipdang, that the woman on the porch (who actually lived across the street), does look like she is behind the visor/swing. I can also see what looks to be supports for the visor idea, that go to the windshield frame - light on this side, dark or shadowed on the far side. In my searches, I did find one pic, only one pic, that had something in it that resembled such a visor in any way. It was below the top, had similar supports, was three-segmented. (Pic attached.) 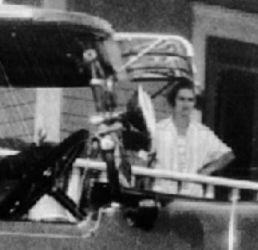 The car was a Studebaker Phaeton four door, I believe. I saved a copy made this clip. Pound for pound wood artillery wheels were stronger than steel. 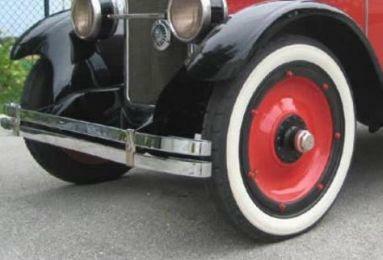 Steel disc wheels tended to bend if you slid into a curb. Wire spoke wheels ride softer because the weight is hanging from the top meaning the spoke is in tension and there is a slight twist in the wheel under shock. A wood spoke wheel's spokes are in compression so every jolt goes straight to the driver's bottom. I was wondering about three groups of people in regard to the perceived value of disc wheels - the showroom customer, the passerby and the collector today. For someone looking to buy a car I am assuming it was customer preference (since it seems to be debatable which type of wheel is better). What about the curb- and drive-by appeal for onlookers, and what do collectors today value more - disc or spoke? Ask 10 people and get 12 answers. Some prefer "original" to the specific car. Some like sporty and some like the idea of rarer accessory wheels. I think it is more appearance (to the beholder) than anything. 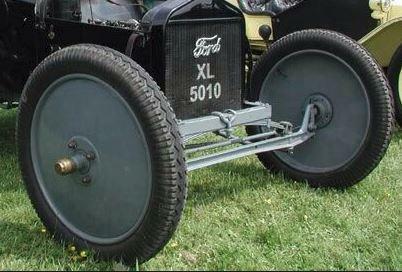 Most early cars used wooden spoked wheels (pre 1920's) a carry over from the days of horse drawn wagons/buggies. Higher end cars at that time often used wire spoked wheels. Early on, steel disk wheels were more likely to be found on more utility vehicles, trucks for example, where maintenance, cleaning & heavy use were factors. For a short period in the late 20's and early 30's, manufacturers were offering all 3, with wood spokes typically standard equipment and wire spoke wheels the most expensive. During this time, wheel diameters were also changing significantly. Rim diameters went from 21"-26" in the teens to only 15"-16" by the mid 30's, and while wooden spokes made sense on a 22" wheel, they became short and stubby on a 16" wheel, and so "artillary style" steel wheels were developed, with the appearance of pressed steel "spokes". 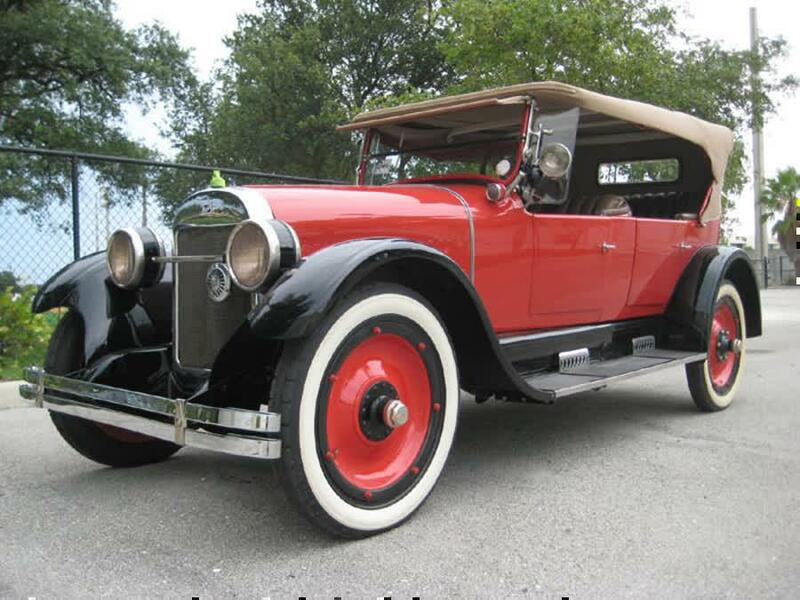 While restorers like to stick with authentic appearance, many choose wire spoke wheels if they came as an option on car originally, as they give car's a more sporty and light appearance. Wire spoke wheels pretty much disappeared by late 30's as wheel diameter resulted in very short spokes, and wheel disks or hubcaps on steel wheels became the norm. Wire spokes were also prone to torque twisting action as cars became more powerful. All 3 styles had their pros and cons. Wooden spokes could rot if not maintained. Wire spokes could loosen or bend if impacted. Steel disks were subject to rusting. All types used tubes and inner liners to prevent chafing. Finally, tire changing methods changed over time, and before the drop center rims were developed, various kinds of snap rings, lock rings, split rims etc were used. TMI? Thx all for replying. TMI? Never. This is all good information. I never really knew disc wheels existed until about a week ago, and all I knew to call them was "solid" (obviously not that helpful in searches). 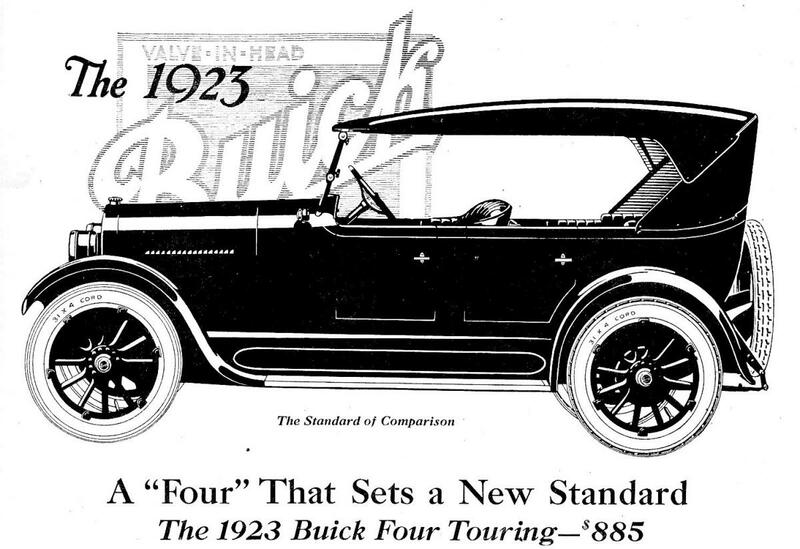 I was interested in what the reverse of the disc wheels on the Buick '23 (right) might look like, but in most pics of vehicles with disc wheels, the inside of the far side is not visible. Does this image (left) about another car depict typical disc wheels? These look simpler than the ones on the '23, these look to be one-piece. Remember that many of the disc wheels seen on cars of that era were aftermarket, event he factory optional ones. There were many different makes of disc wheel as well. Roads at that time were often not much more than clay, esp. in rural areas. They turned to mud with rain. Disk wheels are a great deal easier to clean than any spoked type. Neither do they get mud caked in between spokes. In addition, there were still a few horses around, leaving little steaming piles on the road. That wasn't nice to get off once it dried. Cow pats are much harder to get off when they dry on your gear and the roads were frequent droving routes, in this country at least. So what I am saying is that a person who didn't like cleaning his car might have disk wheels! Me, for instance. The inside details for disk wheels would be same as for other types. The Model T you show is before front wheel brakes were aded to those cars. Normally there would be a front wheel brake drum and shoes along with the various rods/cables/levers etc. I had planned to make one more post about another car in the family on the maternal side that I thought belonged to my great grandfather. It is a picture I long remember, of my great grandfather and my great grandmother. The car is off to one side and for the most part only the rear is visible. It is parked just outside of a garage with one door open.The picture is one of the oldest I have. So, I wrote the post, and posted it. I thought the car in it was going to be too difficult for me to find on my own. It had one notable feature that I had been unable to find in searches - an oval window at the rear of the car. Not as large as other windows in other cars, certainly not rectangular, and just one window not more. Then I had a bit of an inspiration. I thought if his son owned a Buick, maybe the father owned one, too. So I focused the search on Buick alone and sure enough I found one. It looked familiar, and well it should. It was the same as the car that resulted from this search. The car in my great grandfather's driveway was the same car as the one in my grandfather's driveway. I removed the other post once I understood. 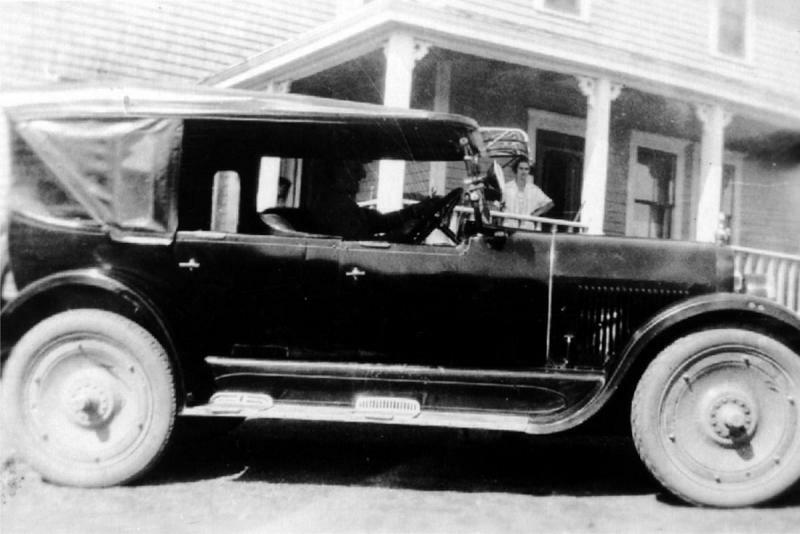 So here is another photo, an older photo, of what I believe to be the same '23 Buick Country Gentleman, with my great grandfather and great grandmother having their picture taken, car in the background. 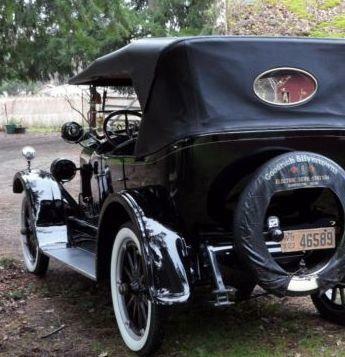 Because of my great grandfather's advanced age (70 at the time the car was built), I now think he must have bought the car new only to pass it down to his son after a short period of ownership. It's an interesting parallel to the related post about the '35 Chevrolet Master DeLuxe sedan which turned out to be my grandfather's car being driven by his son. My great grandfather died just shy of his 80th birthday, in 1933. The history and the charm of these old photos is lost when they are defaced. The faces and expressions are truly from another time and add context to the photos.